Jeb Bush says he misheard Megyn Kelly’s question about Iraq. Nevertheless, his answer is revealing. Much has been made of Jeb Bush’s bumblin’ fumblin’ stumblin’ answers and semi-answers to the question of whether, “knowing what we know now,” he would still have invaded Iraq. Critics suggest we should have known Jeb’s position on this issue long ago, that “hypothetical” questions of this import can’t be ignored, and that he was over-prepared and thus locked into anticipation of a slightly different question—with a very different answer. I believe—as I think most people do—Jeb was telling the truth when he said he “misheard” Megyn Kelly’s question heard round the political world. Which is why something else he said during that same fateful minute bothers me much more, even more than a week after he said it. Here’s the thing, Jeb: You and I don’t agree on everything. But your record is better than many people recognize, and I appreciate your willingness to explain positions that you know don’t mesh well with the conservative base of the GOP. If Jeb Bush can’t refrain from invoking the memory of his brother then the 2016 election will be a dismal echo of 1992 but with an even sadder ending. I’d vote for you over Hillary or any other Democrat any day of the week. But the last thing this country needs is another Bush versus Clinton election…and you know it. Which is why you’ve made such an effort to say, repeatedly, that you are your own man. So, for cryin’ out loud, why would you inject your brother’s name in a key answer to a key question during a high-profile interview and further elaborate that at least on that issue you and your brother are interchangeable? By going back to his brother, even if you believe his brother was right about the topic at hand, Jeb’s becomes a discussion and a candidacy of the past rather than of the future. The country is starving for a vision of a future of real hope and real change based on real ideas, not retreads either of “compassionate conservatism” or FDR-style mindless “topple the rich” Progressivism. People rarely think about Bush and, even in politics, absence often makes the heart grow fonder. Sure, George W. Bush looks good these days. Barack Obama would make any president (other than Jimmy Carter) look good in hindsight. But that’s because people rarely think about Bush and, even in politics, absence often makes the heart grow fonder. But Jeb doesn’t seem to realize the value is in the absence, not in the appeal to authority, not in sharing a strategery (even an ingrinable one) with a man who was below 30 percent approval for much of his last year in office—a fact of which Hillary, her supporters, and the George Stephanopouloses of the world will remind everyone at every turn in 2016. With every brotherly mention of George W. Bush, the forty-third president’s unpopularity—between June 2005 and the time he left office in January 2009, he never had approval ratings as high as his disapproval ratings and by the end they were two-to-one against him—rubs off on Jeb. 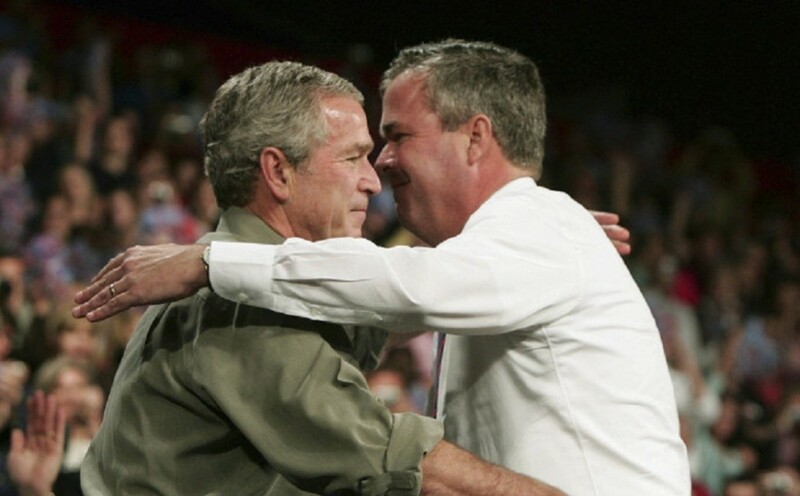 Beyond that, Jeb just loves and appreciates George too much to throw him under the bus for political gain. We should all be so lucky to have such a brother. Mitt Romney’s loss to a weakened and beatable President Obama 30 months ago offers a cautionary tale for those considering supporting Jeb Bush during this primary season: Romney was the single worst candidate to confront President Obama on the issue of Obamacare, arguably the most important domestic issue (or at least it should have been) during the 2014 election season. Having enacted Romneycare in Massachusetts, Mitt was simply in no position to be a credible critic of a de facto government takeover of the health insurance industry through jaw-dropping Democratic abuse of every aspect of lawmaking. Jeb Bush is the single worst serious Republican candidate to explain how the Republican Party is not the party of his brother or his father. Similarly, Jeb Bush is the single worst serious Republican candidate to explain how the Republican Party is not the party of his brother (after whose presidency the GOP brand was in tatters, though GWB had plenty of GOP congressional help in that) or his father, even if—and I think there is some validity to this—he really is different, better, or more conservative than they are on many important issues. Jeb’s friend, Sen. Marco Rubio, was wise to launch his campaign by criticizing Hillary Clinton as a “leader of yesterday (who) began a campaign for president by promising to take us back to yesterday.” As Rubio continued, “yesterday is over and we’re never going back.” Rubio is right, and not just in the literal sense. This all but disqualifies Jeb Bush, particularly when, even if unprovoked, he insists on reminding us that he isn’t and, despite his best intentions, really cannot be his own man. It may not be entirely fair to paint Jeb Bush with the yesterday brush. But how can you not do it when he grabs the palette and makes the first broad stroke for you?